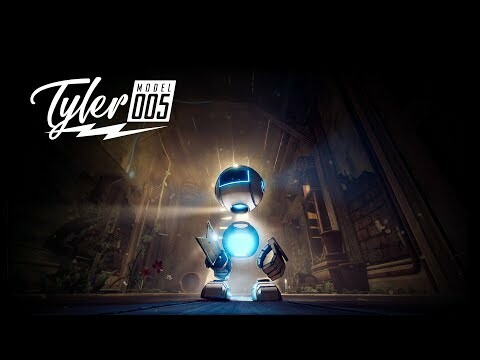 Tyler: Model 005 is a 3D action-platformer and exploration game set in the 1950s where you customize and control a spunky miniature robot named Tyler. Many years after powering down, Tyler is accidentally powered on during the height of a thunderstorm. Now you must discover why your creator is missing and what has happened to your home, which is overrun with rats, spiders and more. Because you are a minuscule robot, normal items take on a completely new dimension in Tyler’s world: for example, chairs, stairs and bookshelves are giant obstacles. It’s your job to navigate through your surroundings and find out as much as you can, collecting objects and solving puzzles along the way. Wear a huge assortment of diverse outfits, from medieval helmets to pixelated eyeglasses, and battle varied enemies with your trusty bolt-blade, boxing gloves, cherry bombs and more! Discover all that Tyler is capable of as his adventures begin in Tyler: Model 005! Tyler: Model 005 was released on PC and Xbox One 242d ago in the US and the UK. Notify me when Tyler: Model 005 is available.